The P’Kal’s Plain Edge blade is full-flat ground from CPM-S30V stainless steel and features a slightly curved edge for impressive cutting power. 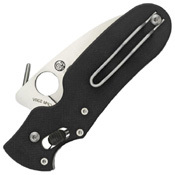 A removable post-style Emerson Opening feature provides amazingly fast one-handed blade opening by hooking on the pocket during the draw. It can also be opened manually with the Trademark Round Hole. 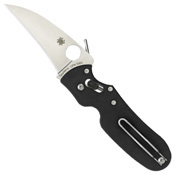 As a “reverse-edge” tool, the P’Kal’s handle is ergonomically designed to be held with the sharpened edge facing inward toward the user to facilitate powerful pulling cuts. 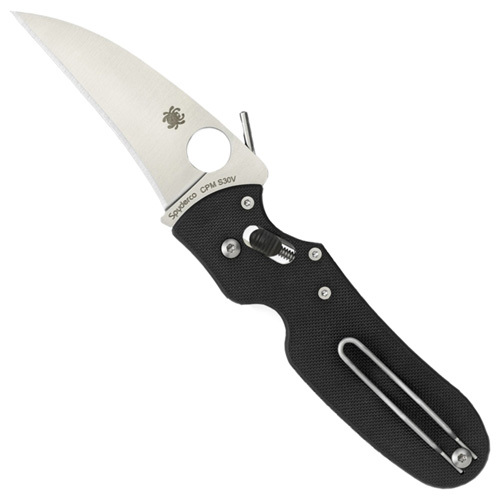 The handle’s skeletonized full stainless steel liners are capped by textured black G-10 laminate scales and house Spyderco’s patented Ball Bearing Lock—an extremely strong lock mechanism that is also completely ambidextrous. To support all appropriate carry and deployment methods, the P’Kal also features a reversible steel wire clip that provides tip-up, edge-forward and edge-back carry on both the left and right sides.